I used to bake my own granola every few weeks. I'm not really sure why I ever stopped, but what better time to start again than on a rainy 4th of July! Recipe brought to you by the Smitten Kitchen. 2. Bake for 45 to 55 minutes. About halfway through the baking time, use a large spatula to turn over sections of the granola carefully, breaking them up as little as possible. 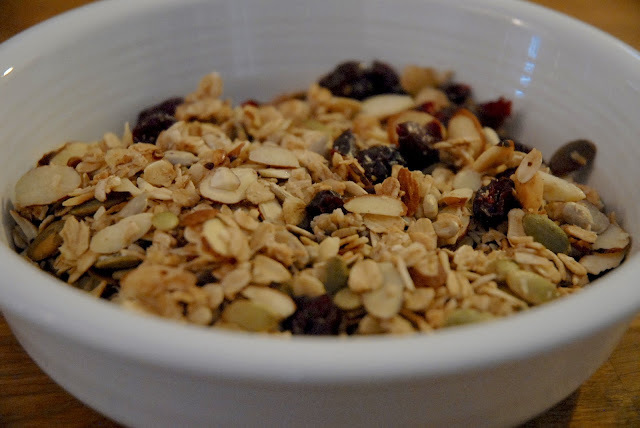 Rotate the pan if granola is baking unevenly. When it is evenly browned and feels dry to the touch, transfer the pan from the oven to the cooling rack. Cool completely. Once it’s completely cool, break up granola into whatever size clusters delight you. Sprinkle in dried fruit. 3. The granola keeps at room temperature in an airtight container for 2 weeks. It keeps even longer in the freezer, if you’re the stockpiling type.